The Jasna Gora Family of the Rosary is a prayer community that has existed for many years in the church of the Holy Spirit at Dluga Street in Warsaw. It gathers people of all ages who, through the prayer of the Rosary and the fulfillment of the Statute of the Jasna Gora Rosary Family, wish to serve the Church, promote the work of evangelization, and seek to sanctify their own lives and these of the neighbors, especially their loved ones and those in most need of Divine Mercy. On every first Sunday of the month at 8.00 a.m. the entire community meets at Mass in the Pauline Church at Dluga Street, dedicated to God’s blessing for all the members of the Jasna Gora Family of the Rosary and for eternal life of the deceased worshipers of the Lady of the Rosary. After Mass there is an exchange of the mysteries of the rosary between the members, and the common prayer. There is also a meeting for common reflection on the current affairs of the Church and a friendly conversation in the fraternal spirit and a discussion of the current problems of the functioning of the Jasna Gora Family of the Rosary Circle and its tasks in today’s world. The Jasna Gora Family of the Rosary takes part in the October annual retreat of the Jasna Gora Family of the Rosary, organized by the Leader of the Family, Father Bogumił Schaba at Jasna Gora. Almighty and merciful God, out of incomprehensible love for us, you wanted that your Son, by the power of the Holy Spirit, received the body of the Virgin Mary; died on the cross and rose from the dead. Bless everyone who will pray with their lips and heart on these rosaries in honor of your Son’s Mother. May they persevere in true piety and deserve to stand before Your Face with the Blessed Virgin Mary. By Christ our Lord. Amen. I, NN, take you today, the Virgin Mary, Mother of God, for my Patroness and Advocate, humbly asking you to continually support me in all my needs, now and at the hour of my death. Amen. This Millennial call was undertaken by the Jasna Gora Pauline Father, Dr Bronislaw Robert Matyszczyk, who with reference to the centuries-old tradition, revived at Jasna Gora the movement of the rosary prayer. The established Jasna Gora Family of the Rosary was given to the care of the Holy Guardian Angels. During the Feast of Our Lady of Czestochowa, on August 26, 1970, Jasna Gora Family of the Rosary received the pastoral,blessing, and on 5 August 1974, was legally established and approved by Primate Stefan Cardinal Wyszynski. The task of the apostolate of Czestochowa Family of the Rosary, led by Father Founder and present Director (…), is to implement the objectives of the Community of Prayer, and above all spread the cult of the Blessed Virgin Mary, through the promotion of the rosary prayer, as an active help to the Mother of the Church. Apostolate of the Rosary Prayer, referring to the Brotherhood of the Rosary existing since 1610 at Jasna Gora, is called Jasna Gora Family of the Rosary under the supervision of the Guardian Angels. Jasna Gora Family of the Rosary is a private association of the faithful and the religious community of the Church, and is built on a living faith, on the basis of a special cult of the Blessed Virgin Mary. Jasna Gora Family of the Rosary has a purely religious and spiritual character, therefore it is not related to any social organization. In the sense of responsibility for the development of the Kingdom of God on earth, Jasna Gora Family of the Rosary Prayer cooperates with the Church hierarchy in the implementation of the missionary task of the Church. A special task of Czestochowa Family of the Rosary is a prayer for the intentions of the Holy Father, Bishops and priests, and the whole people of God, as well as concern for the salvation of every human being, for the renewal of religious life and social and universal peace of God in the world. Prayer and active charity, following the example of Jesus and his Mother, Jasna Gora Family of the Rosary brings help to all the needy in the parish, especially eagerly praying for the suffering and the dying, uniting their souls to God. Recitation of the Rosary and the life according to the contemplated mysteries of salvation, opens people’s hearts to the Holy Spirit, gives birth to spirit of the apostolate of prayer and cooperation with the pastors of each parish. Admission to the Jasna Gora Family of the Rosary is done directly in the secretariat of Jasna Gora in Czestochowa, or by mail. To Jasna Gora Family of the Rosary can belong both the faithful from Poland and abroad. The person who publicly withdrew from the Catholic faith or broke from the ecclesial community, or is subject to excommunication imposed or declared can not be admitted to the Jasna Gora Family of the Rosary (see Can. 316 CCL). Those who, in accordance with the statutes were admitted to the Jasna Gora Family of the Rosary, and the case referred to in paragraph 9a would take place, should be immediately expelled. Except as provided in paragraphs 9 a, b, the person who was admitted to the Jasna Gora Family of the Rosary, can not be expelled from it. The registered office of the Jasna Gora Family of the Rosary is Jasna Gora in Czestochowa at Kordeckiego Street No. 2. The primary residence of the Founding Father is the Pauline Monastery in Czestochowa at Jasna Gora. Jasna Gora Family of the Rosary in its entirety is subordinate and subject to the General Administration of the Pauline Order, which – in accordance with can. 305 of CCL – will take care of it, help to keep the faith and customs intact, and will oversee not to let abuse into ecclesiastical discipline, as well as take care of administration of material goods. The Board of Jasna Gora Family of the Rosary consists of: Fr. Director, his deputy and the Chief Council. Director of Jasna Gora Family of the Rosary is appointed by Father General of the Pauline Order. Chief Council of Jasna Gora Family of the Rosary consists of 15 people. Members of the Chief Council are appointed by Father Director from among the distinguished adjutors, for a period of 4 years, notifying the Father General. 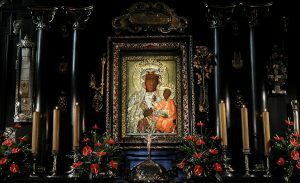 Each Director of Jasna Gora Family of the Rosary, in consultation with the Chief Council, selects one of the Pauline fathers as a candidate for his deputy and submits it for approval to Father General. Each Director of Jasna Gora Family of the Rosary selects a secretary from among the members of the Chief Council to cooperate with him. The Board, chaired by Father Director, will meet at least four times a year to discuss issues and pastoral problems arising from the operation of Jasna Gora Family of the Rosary and current tasks of the apostolate of the Rosary. Father Director shall receive voluntarily sent offerings and administer them according to the decisions of the General Administration of the Pauline Order, and on a monthly basis shall account for income and expenditure before Father Administrator General of the Pauline Order (cf. Can. 1301). At the end of each year he will provide a written report to Father General of pastoral activity and the apostolic administration of the Jasna Gora Rosary Council. Adjutor of Jasna Gora Family of the Rosary can be a priest, monk, nun, or lay person belonging to this community of prayer. The persons holding the function of adjutor should be of a living faith, apostolic zeal in the service of God and of Mary, the love of praying the rosary and honesty and active charity. Lay people applying for a function of an adjutor, should provide the Father Director or his deputy, with a certificate of morality from their own parish priest and permission to carry out apostolate of Jasna Gora Family of the Rosary in their parishes. Adiutors when applying receive a certificate of apostolate and detailed information about the apostolic activity of Jasna Gora Family of the Rosary. The main task of adjutors, in consultation with their pastors, is a concern for the development of the community of prayer in their parishes, integrating new members, care about the development of the spiritual life within the Christian doctrine of the Church, and the comprehensive implementation of charity, so that through faith-based witness of life, they could attract their neighbors to Christ. All adjutors promote the rosary in their environment, teach how to pray the rosary, try to fully participate in Sunday and holiday Mass, often receive the Holy Sacraments, especially on the first Fridays and Saturdays of the month, every day read the Holy Bible. Spiritual participation of adjutors in the charism of Jasna Gora, shall not weaken the ties with their parish, but it has to deepen and enliven them in cooperation with the Holy Spirit. Moreover, pure and noble love of God and neighbor, characterized by the worship of the Mother of God will make all adjutors invite their wards to participate in the annual retreat and indulgence ceremonies at Jasna Gora in honor of the Queen of the Holy Rosary. Once a month at Jasna Gora and in the parishes a Day of Prayer and Spiritual Renewal is held for all adjutors. Belonging to the Jasna Gora Family of the Rosary obliges all members to the daily recitation and reflecting upon at least one mystery of the Rosary of their choice. Persons belonging to the parish Rosary roses can join in the Jasna Gora Family of the Rosary and are not obliged to recite another mystery of the rosary. All of them united in praying the rosary are one big community. Every year on the first Sunday of October Jasna Gora Family of the Rosary participates in the indulgence ceremonies at Jasna Gora, in honor of Our Lady of the Rosary. Before the patronal ceremony, a three-day retreat for all members of Jasna Gora Family of the Rosary is held in the Basilica of Jasna Gora. The members should participate in the retreat offering it in a special way for the intentions of the Holy Father and the Church. On the first Sunday of every month in the Chapel of the Rosary at Jasna Gora the pastoral meeting of Jasna Gora Family of the Rosary will be held, which will be chaired by Father Director or his deputy. VIII. Privileges of the members. Please note that for reciting one part of the rosary in the church before the Blessed Sacrament, members of Jasna Gora Family of the Rosary obtain a plenary indulgence under the usual conditions. Members of Jasna Gora Family of the Rosary receive a special blessing of the Holy Father, with a plenary indulgence at the hour of death. Every day at Jasna Gora Holy Mass is celebrated for all members of Jasna Gora Family of the Rosary. Brothers and Sisters of Jasna Gora Family of the Rosary benefit from special care and aid coming from the promises of Our Lady of the Rosary, and spiritual fruits, arising from the common prayers and merits of the prayer of the entire community. For the deceased members of Jasna Gora Family of the Rosary throughout the month of November Gregorian Mass is celebrated at Jasna Gora. Daily we recite and reflect on at least one mystery of the Rosary, in our free time more than one, so we carry the rosary always with us. We pray the Rosary for the intentions of the Holy Father, bishops and priests, the Church, and especially for the conversion of sinners, peace between nations and for all members of Jasna Gora Family of the Rosary. We often proceed to Holy Sacraments. On Sundays and holidays we participate in the Mass. We help the poor and needy. We visit the sick and the suffering. In the apostolate of the Rosary we co-operate with parish pastors. Every year we take an active part in the retreat at Jasna Gora, which is held for three days before the first Sunday of October (Thursday, Friday, Saturday); it starts on Thursday at. 9:00 a.m. in the Basilica, ending on Sunday before the Summit at 11:00 a.m. at Pontifical High Mass. Along with the diploma of admission to the Jasna Gora Family of the Rosary, founded on 6 January 1968, we get a blessing of the Holy Father together with the plenary indulgence for the hour of death. 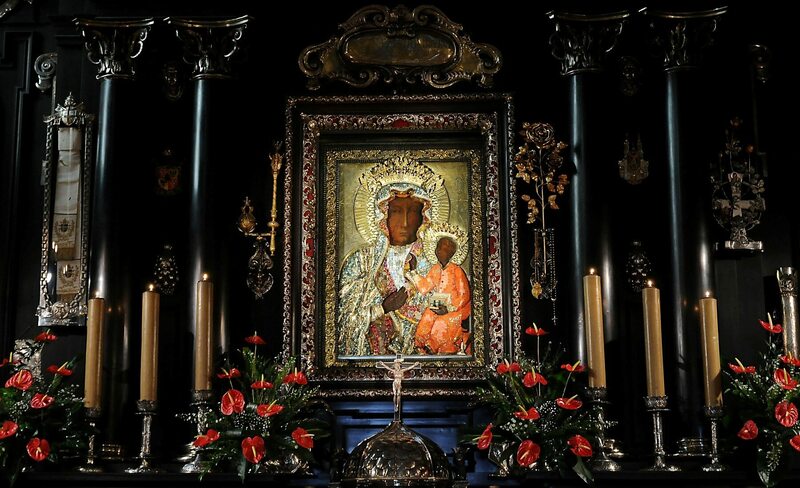 Every day we celebrate perpetual Masses at 7:00 a.m. before the Miraculous Icon of Our Lady of Czestochowa for all members, living and deceased, of Jasna Gora Family of the Rosary. We take advantage of the prayers and merits of the whole Family of the Rosary, currently counting more than eleven million members, whose Statute was signed by its Patron – the Holy Father, Pope John Paul II. Whoever will serve me by the recitation of the Rosary, will receive a special grace. I promise my special defense of all those who will recite the Rosary. The Rosary is an effective weapon against hell and will destroy all heresies in the world. Recitation of the Rosary will make virtues and good works to flourish in the Church and will give a wonderful fruits of salvation. Each one who prays the Rosary every day and reflects on its mysteries, shall not perish for ever. Those who are in any need and will turn to me in praying the Rosary will always be heard. Whoever will honor me by the recitation of the Rosary will not die a sudden death, without the holy sacraments. The faithful, through the recitation of the Rosary will have in their life and at death the light of God and the fullness of His grace. I shall deliver from purgatory the souls of those who in their earthy life worshiped Me on the Rosary. The faithful children of the Rosary shall gain a high degree of glory in heaven. The one who prays the Rosary will not be afraid of death, because I’ll be at the hour of the departure of the soul from this world. I will assist in every need all who recite the Rosary and promote it among the others. I have obtained a promise from my Divine Son that all the advocates of the Rosary, will have a special intercession during their life in this world and in the hour of death. All who recite the Rosary are My children and My Son, Jesus Christ. Devotion to My Rosary is a great sign of predestination to Heaven.